We are the preferred framer of the Dallas Cowboys, San Francisco 49ers and the Dallas Stars. Here you’ll find photos of our work, what goes into the framing process, and more–including our jersey framing packages. We frame everything. 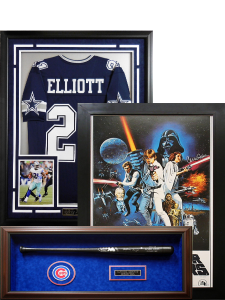 Whether it’s your favorite movie poster, an autographed sports jersey frame, memorabilia for a shadow box, a family portrait, or a custom project taking form in your imagination, we have high-quality framing options to meet your needs. CSD Framing operates outside of Carrollton, Texas and ships within the United States.